Smoke stacks and oil refineries litter the landscape of ‘Chemical Valley’ in Sarnia, Ontario – one of the most industrialized regions of Canada. There are over 50 facilities operating in this region, and the names of large oil companies and chemical manufacturers embellish the stained and greying buildings. Nearby, the brown and viscous Talfourd Creek is surrounded by signs with skull and cross bones, warning people from entering its unwelcoming waters. Sarnia was rated by the World Health Organization as the Canadian city with the worst air quality in 2011. 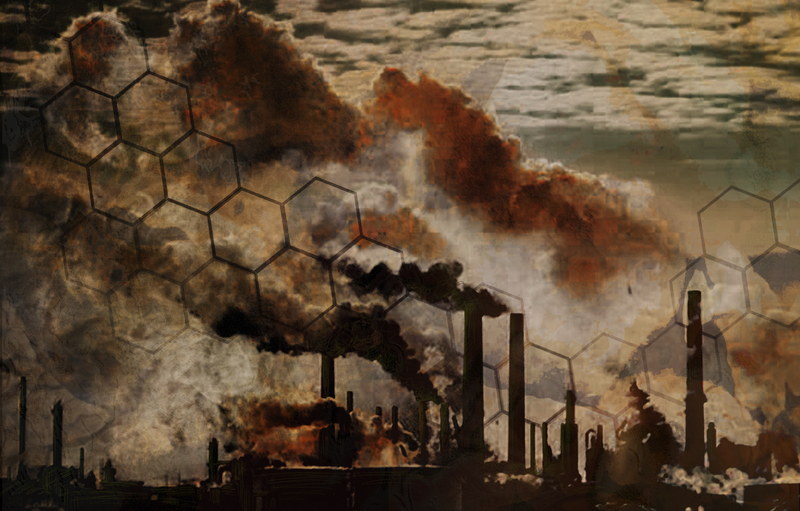 According to a 2007 EcoJustice report, the facilities in ‘Chemical Valley’ collectively released over 100 million kilograms of pollution in 2005. This industrial playground can be found within a 25 kilometer radius of the Aamjiwnaang Reservation, where over 800 people reside. The close proximity of this community to Chemical Valley poses various concerns due to the high level of exposure to industrial pollutants. There have been a number of reported health concerns in the Aamjiwnaang community, including respiratory problems, high blood pressure, headaches, and behavioural and learning problems, among others. A 2005 study in Environmental Health Perspectives found a declining ratio of male to female birth over a ten year period between 1984 and 2003. However, despite the strong belief that these are a result of the toxic chemical exposure faced by this population, there is little evidence of a direct link. Niladri Basu, a professor in McGill’s Department of Natural Resource Science and the School of Dietetics and Human Nutrition, along with a group at the University of Michigan, conducted a study in order to quantify the levels of chemical exposure in the Aamjiwnaang community. These scientists conducted a careful analysis of blood, urine, and hair samples – to assess levels of chemical exposure in mothers and children in the community. Findings from the study confirmed that these individuals were being exposed to environmental pollutants. The level of chemical compounds such as polychlorinated biphenyls (PCBs) and organochlorine pesticides (such as DDR and HCH) were higher in assessed individuals than the average Canadian mother and child. Many of the chemicals assessed are either products of industrial applications or are used in industries, and have been linked with various health concerns. Though this study confirms chemical exposure in the Aamjiwnaang community, the direct effect of this exposure to the health of the individuals has yet to be scientifically quantified. In their recommendations, the scientists state the need for epidemiological and ecological studies to further analyze sources of exposure. “Our ultimate goal is to come up with a very tightly linked, well-proven, and scientifically rigorous linkage between chemical exposures and adverse health outcomes,” Basu told The Daily. The study of the Aamjiwnaang community was funded by various U.S.-based organizations. “While I was at [the University of Michigan] we raised money from [sources in] the U.S. Many people [in the Aamjiwnaang community] were surprised and quite pleased that outside entities were funding this work. They have been asking for this kind of study for decades, and from my understanding, the types of funding they ask for have not been given – especially in Canada,” Basu explained. The Aamjiwnaang are not the only group of First Nations people living in close proximity in areas of high pollution due to extractive industries such as oil and gas. There are various known health implications for the harmful chemicals released by industries, but limited numbers of studies directly quantifying the impact of having homes so close to large industrial centres exist. A larger scale study is needed – one that will cost millions of dollars and take many years – in order to influence decision makers. According to Basu, the next steps for this particular study will depend on what the Aamjiwnaang community decides. As Canada changes the ways that resources are being harnessed for energy and development, the health concerns of the people living within proximity of these industrial complexes continue to be called into question. “We need to be aware that there are risks associated with these activities so we can balance the public health and environmental health risks with the greater benefits for Canada,” said Basu. He hopes that the results of this study will encourage Canadian funding agencies to get on board with conducting studies of this kind.